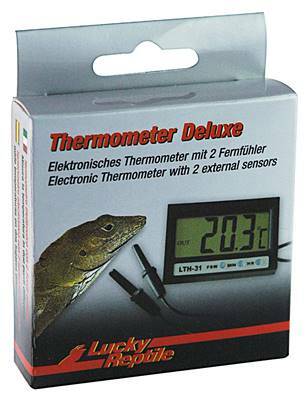 Featuring and accurate and impressive temperature range of -50�øC to 70�øC, the Lucky Reptile Thermometer Deluxe allows for the reliable and consistent monitoring of your reptile's vivarium or terrarium. Heat is amazingly important for reptiles, helping them maintain their rate of digestion and metabolism as well as circulation and general health, having evolved in warmer climates, and so keeping them in captivity produces the need to monitor and maintain the temperature in their home closely so you can make adjustments where needed. The Lucky Reptile Thermometer Deluxe allows you to do just that. It's impressively accurate and utilises two external sensors to take the temperature from both the hot and cold ends of your vivarium or terrarium, giving you the bigger picture in terms of your reptile's living environment. With a large digital display and a clock function, it's reliability and ease of use mean that this digital thermometer is a bargain, especially from Swell Reptiles where it sold at a discounted price with Same-Day Despatch options when you buy before 2pm, Monday to Friday. Perfect for temperature monitoring inside the vivariums. Measures temperature at two different locations. External sensors with 150cm wire.